Design Question What's the rule? By Pepsi Girl, November 6, 2016 in Ask The Expert - How Should I Quilt This...? So I'm not asking this in terms of "Quilt Police" rules. It's more of a design or aesthetically pleasing to the eye kind of question. The quilt I just finished I did a lot of cross hatching. And I did different sizes in different spots. I think it turned out OK but I'm wondering if theres some thought about how many different sizes or if the spot touch each other should they be the same ...? Design is my biggest challenge so wondering if anybody has anything to say about this? That is if it makes any sense to any one but me! It makes sense to me. Are you able to post a picture of what you have done? That might give others a better idea of what is generally pleasing to most. I don't personally like different sizes of crosshatching in one quilt, and I really don't like different sizes in areas that touch each other. I would choose another fill for those areas adjoining areas. I agree with Lynn, I personally don't like different size crosshatching touching each other. But that is just my personal preference. I have been told there are no "RULES" in quilting. I don't have a good picture of the crosshatch. 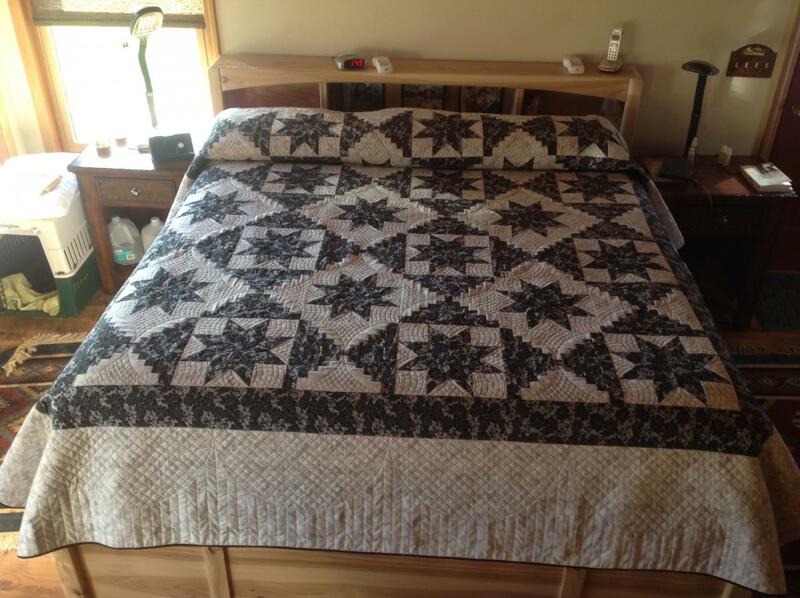 But here is the quilt. I agree there are no rules in quilting, but there are aesthetic, design rules that make things look better. And that is where I suffer at the longarm blues! I like what you have done there. Each area is identified and the small crosshatch is separated from the piano keys well. The quilt looks great. First of all, your quilt looks really good. I was afraid to look at it after your first post, lol. Second, not sure how you decide what to quilt, but for me, if I hang the quilt top on a design wall, or someplace where I can see it while I am working, the quilt will "speak" to me. Not literally, so don't think I am ready for Bellview. I just mean it hits me!! I can really see what I need to do. If you are quilting for customers, then when you load a quilt on your machine, put the next one on the wall, and just gaze at if from time to time while working on the one on your frame. Last, design inspiration is key. If you ever go to Pinterest, then set up a page for Longarm Quiltting or whatever you want to name it. Then just do a search. If you have a particular quilt you need help with, search the pattern name. You will find a weath of information and pictures to help you with ideas. I love Pinterest. I agree with Mary Beth about Pinterest. Start a folder for quilting designs and pin pics you like in the folder. Later, you can decide what you like about each one - or don't like. Have fun! Your quilt looks fantastic! Beauty is in the eye of the beholder. If our tastes were all the same, there wouldn't be as many beautiful creations in quilts out there! Thanks everyone for your comments. I'll ask my daughter to help do the Pinterest idea. The picture may not be good, but the quilt (and quilting) is GREAT! Your quilt and quilting look beautiful. My old eyes didn't see anything I didn't like. In fact, love your quilt! I DO! Your quilt looks wonderful. The only person that needs to be pleased is yourself. There are no quilt police. I also use pinterest to collect ideas for different quilting on specific patterns. I also save a lot of long arm tutorials.